This is a new project which I trust will be instructive, beneficial and a good way to demonstrate the Truth of the Free Grace Gospel as opposed to the Folly of other “gospels.” Anyone can participate, but the administration reserves the right to review and possibly edit some of the comments for appropriate content, grammar or length. Jesus Christ was fully man yet fully God. He lived a sinless life and died on a cross, shedding his blood in the process, as a payment for our sin. It was only by a perfect sacrifice that our sin could be forgiven. Jesus died, was buried, and rose again. He is in heaven and is the only means by which man can be saved from the penalty of sin and thereby escape eternal damnation. Do you realize that you are a sinner that stands condemned before God? Rom 3:23 Do you understand that Christ died for you? Will you this very moment trust Christ alone to be your Savior? The Bible says that whosoever believes on Him (Christ) shall have everlasting life. John 3:16. We don’t “do” anything to be saved. It is a free gift. We only need to BELIEVE! (true) Acts 16;30-31 “what Must I do to be saved? Believe on the Lord Jesus Christ . . .
Romans 6:23(NKJV) For the wages of sin is death, but the gift of God is eternal life in Christ Jesus our Lord. “Our salvation was infinitely costly to God, but it is absolutely free to us.” Quote by Dave Branon. 1Pe 1:19 But with the precious blood of Christ, as of a lamb without blemish and without spot: Eph 2:8-9 For by grace… There is no price that we can add to obtain salvation. Christ paid the price. There is no additional price to be paid on our part. We must simply put out faith in Christ alone to save us. Statements Below are Inappropriate, False or Erroneous Presentations of What is Called, “the gospel” (again, these statements below are NOT the true gospel of the Bible). So I would like to add that the notion of “praying a sinner’s prayer” or “asking Jesus into your heart” is one example of a false or faulty gospel. Erroneous faith + works analogy: Salvation is like a row boat. One oar is faith. The other oar is works. If one uses one oar only, the boat goes in circles. If both oars are used, the boat travels in a straight path to its destination (i.e., heaven). But we are not going to Heaven in a rowboat. Rather, we are carried to heaven on the shoulders of the good Shepherd, Jesus Christ! (this is a common tract prayer) believe in Jesus, feel sorry for your sins and turn or be willing to turn from your sins etc, etc. Faith consists of “a firm conviction…a personal surrender…[and] conduct inspired by such surrender” (173-174). According to this definition, faith includes conduct, that is, works. Faith is conviction, surrender, and conduct. Here was one on FB: Instead of hugging and accepting a sinner in their sin, how about warning them of the truth of hell damnation and salvation through repentance to Jesus? Few warn because most are with sinners on the broad path to destruction. TIME TO REPENT AND DEDICATE TO JESUS AND BE SEPARATE FROM SIN. . . . When asked what one did with the woman at the well or later they asked about why Paul still sinned, this was the answer: Dear soul, those whom were forgiven were changed and left their sin…Jesus didn’t forgive those who stayed in their sins…He didnt say to the pharisees who refused to repent “Your sins are forgiven” Dont be fooled if you stay in sin and won’t turn from the broad path, then you won’t find the forgiveness needed to enter heaven…Rather hell instead…Time for you to repent and seek to know Jesus and he will lead you and forgive you……. God commands all men everywhere to repent of their sins, turn to God, and believe in the gospel of the Lord Jesus Christ. Come to Him and flee from the wrath to come! To repent is to turn away from everything in your life that goes against God’s will, including your works, words, and thoughts. Stop fighting against God! Fall down before Him and stop trying to justify yourself and think you’re good enough. Admit your wickedness before a holy God, your helplessness to do anything to please Him, and trust in nothing except what Christ has done. If you come to Christ, repenting of your sins and believing in Him, you will be saved. . . . This entry was posted in Assurance of salvation, Bible, Calvinism, Christian, Christianity, Cross, Eternal Security, Faith, Free Grace, Hope, Lordship, Lordship Faith, Lordship Salvation, Peace, Resurrection, Secure salvation, Security of believers, Security of the believer. Bookmark the permalink. That’s a good idea Henry (except for the Kirk part) 🙂 , I have done that in some of my emails, I have Bible verse pictures, if you like, link any of these. Henry, welcome and thanks for your comment. Include a link to an online gospel tract (link removed by administrator) as part of your email signature. What would you all recommend doing for gospel tracts? Is there a place to order them? Or should I make them personally? We have no tracts but you are welcome to go to Dr. Cucuzza’s page and print out any of several PDF files and use them as a witnessing tool. Yes , Thank you my friends for the welcome , I love yankee Arnold and the simplistic message he brings him and Hank Lindstrom God used to help me reprogram my mindset that was bent on works salvation lordship salvation and the likes to me I call it the spirit of Cain and just lump them all together. Yes a sinful lifestyle after salvation is not good and grieves our Fathers Heart, resulting in a loss of reward. Hi Curtis, funny, I was listening to several sermons recently by Dr. Ralph (Yankee) Arnold on youtube. One was “A powerful gospel message”, another was “How to know you are saved”, and another about the book of John and also Paul’s conversion. One on Calvinism, but the theme is the same. What seems to upset people is that Grace is Free. They see people living terrible lives and we don’t see much in the way of church discipline so many have decided to adjust the standards for the gospel. One somehow was so angry regarding Yankee’s Powerful Gospel message, that he said this…. I didn’t quite believe that he didn’t see what he just had said in order to speak against licentiousness. Or perceived preaching of it. I believe our churches need to teach the people God’s Word, and people need to be active participants in fellowship with Christ and with the body of Christ. But that has to do with our walk with Him, but not with salvation. People do need to get their salvation settled, but when you understand grace, it’s like being married to a man that loves you, the good, the bad and the ugly. He knows you so well, he anticipates your next move. He smiles when you are cross and points you in the right direction or makes you laugh. Do you want that for a husband, or one that insists you do certain things, and live by certain rules and prove to him that you are worthy of his love? Yes, you are most welcome here! Your statement about the permanency of salvation was correct; however, for a believer to live a life of sin would be a travesty, for it would displease God, hurt the person and others around him and it could result in the loss of rewards in heaven one day. There are warnings against sinful living for the believer: 1 Corinthians 3:14-15 reads, “If any man’s work abide which he hath built thereupon, he shall receive a reward. If any man’s work shall be burned, he shall suffer loss; but he himself shall be saved; yet so as by fire” (cf. 2 Corinthians 5:10). In addition, John, in 1 John 5:16, warns against a lifestyle of sin which, while not causing one to forfeit his salvation, nonetheless, it might cause him to lose his life. I believe that Ananias and Sapphira were examples of believers who committed a sin unto death (Acts 5). I have actually witnessed what I believe to be 1 John 5:16 carried out in the lives of three believers over the years. Yes, from all outward indications, true believers, but those who would not give up sinful lifestyles (two womanizers and one embezzler). In each case, they were taken out of this world in their fifties with massive coronaries. That was last week, I have been pondering and seeking since then and found this blog. I see now most in the group are into LS from the response I received. Can I hang out here ? Hi Holly, Bryan . . . Thanks for your interest and encouragement. Not sure how much I want to detail here but overall it was a non event. I really don’t think I’m going to suffer what many usually do in a similar circumstance. My former church was about as close to Free Grace as one can find around where I live. In fact, the sermon my pastor gave on my last Sunday there was so close to a clear gospel presentation from a Free Grace perspective that I ALMOST put off leaving. But close is not hitting the mark, and the remaining discrepancies and “peripheral” errors remained problematic enough that I had to stick with my decision and move on. My pastor was very understanding and knew it was not an easy decision as we’d become pretty close over the years. I attended this church for almost 7 years but made it clear I no longer could justify attending based on irreconcilable differences regarding our views on how one is saved and how one can have total assurance of one’s eternal position and standing before God. He wished me blessings on where The Lord is leading us next and thanked me for the fellowship we’d enjoyed over the years. John – It is sad, for them, because it tells me they do not understand the gospel themselves…. I have had people tell me the book of John is not the “whole counsel” regarding the gospel, and believing is not all there is to it. John 20:31 tells me a different story. But, the gospel is all over His Word, but they still want to add (or take away), I thank the Lord that he came for the lost, and that I wanted His grace, believed/received/trusted in Him. From out of the frying pan into the fire? 🙂 Nine lives? So many thoughts came into my mind, how did it go for you at church? God will bless you for standing for the truth, even if the people curse you, or condescend to you, or label you a troublemaker. I wondered sometimes at some of the names “Christians” called me and/or the way “Christian” men had no issues with unkind words, sarcasm, belittling, etc. I knew that wasn’t from the Lord, so I actually felt sorry for them. I know someone can have a bad day, but some of the disgraceful ways men have spoken to me…. I just shake my head. I only say this, for I know you will experience the same, and just want to encourage you too! Let us know how it goes, I sure hope I don’t have to write a “Dear John” letter to my Church. I’m still waiting a response from my pastor after I gave him Ray Stanford’s book with a personal letter on my feelings on LS and the teachings of the Baptist Church 3 weeks ago. Holly, how sad about the person who said you “preached a half gospel”! There are so many for whom the preaching of the cross is foolishness – namely, those that are perishing (1 Corinthians 1:18). I am afraid this may include many of those who think the Gospel is only half a gospel. Thank you, Holly, for your kind words and encouragement. As for the “false gospel” you shared above, I’m not even sure I can get through it. I had to stop reading about 12 points into it. But I may go back and read it all just to exercise my discernment muscles . . .
Blessings to you and everyone at Expreacherman.com, be you administrators, comment makers, or benevolent lurkers . . . Thanks for your research. 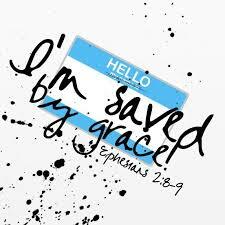 You reminded me today that simply being non-Calvinist does not automatically mean that a group has the right (Biblical) Gospel message of Ephesians 2:8-9 (We are saved by grace alone through faith alone in Christ alone! ), 1 Cor. 15:1-8, John 3:16-18 and Acts 16:30-31. Needless to say after presenting THE gospel, eventually I was removed. You probably will not be floored, you’ve probably seen it all, but here a man tells us how we can be saved. Everyone can BE A CHRISTIAN if people turn away from sin, repent from sin, and become a disciple. How to become a disciple and be a disciple? 1. IF you have sin in your life – confess your sin and repent. 9. Teach people that God’s grace is not a “prawn sandwich” and that we should not sin upon grace. 10. Getting people to the mercy of God instructing us to live righteously – Not continue sinning. 11. Teach people that we are not saved/justified by faith – Without obedience we are not saved. 12. Teach people to keep going PRAYER. 13. Teach people to keep going BIBLE READING. 14. Teach people to keep going HYMN. 16. Getting people to go out and make disciples. 17. Teach people not to believe in Calvinism. 18. Teach people to not believe in OSAS. 20. Teach people to keep EVERYTHING what Jesus said. 21. Teach people that it is important to confess their sins and to repent IF we want to be cleansed from our unrighteousness/uncleanness. 22. Teach people that Daily Repentance involves Daily sin, and that you do not take up his cross Daily then. 23. Teach people that Jesus is needed to walk with us and that he Will give us strength IF we seek for it and take strength from he WHO gives us the strength/power to keep us sinless – Obviously it is up to us whether we obey the spirit or not. 24. Teach people that it Will not be “rosy” in the Christian life. 25. Teach people to keep peace with all and as far as depends on them/us. 26. Teach people to be/become wise and guide them so that they go in the right path and doing the Will of God. 27. Teach people to GO OUT and lay hands on them sick, as Jesus did. 28. Teach people to discern what is right and what is Wrong teaching from scripture. 30. Teach people to serve each other and above all God. 31. Teach people to get rid of errorists. 32. Teach people to use God’s grace as it stands in Titus 2:11-13 – Not Jude 1:4. FryingPan9-hope it worked out for you, leaving the church, I pray some truth was received. I don’t understand why men want to compromise, except for I guess they don’t seem to know where to draw the line. Some I have spoken to have been quite loving in the beginning, but when pressed, I have been surprised to see how angry one can get if you cross into questioning one of their favorite teachers, sources, authors, etc. Even while using the Word. I don’t try to be hated, and I am sensitive, so in truth, I hope it’s not because I’m so persistent, or it’s Holly they’re hating. I have met some true bullies, others just feel they are “teaching” me and generally end up declaring me “unteachable”, or as the recent one said, after saying I preached a half gospel, that I was also “proud and unfortunately unteachable holly. look at you. completely impenetrable against the truth. deceived, stubborn, unteachable, and proud. lethal combination. Indeed. The only reason to pay attention to Calvinists is to deliver oneself and/or others from their infernal influence. I don’t think there is any need to publish your version of Stewart’s Gospel web page. Yeah , sorry for that long tract from Stewart, well I for one would not endorse his site 100% and as Jack mentioned as a reply to my post that his style is so much as he termed “bombastic”, and while some people may be brought to Christ through Stewart’s style, I believe there is much more better way to do that, which is by preaching God’s Grace (Rom. 2:4), and not simply by calling names. I do appreciate his sincerity and passion for truth but to call others “xxxxx”, “xxxx” , “loser”, “sicko”, etc., while claiming to love sinners (of course he also calls himself a sinner) ? And lastly , I’m glad that the admins of this blog does not talk like Stewart, but of course we should pray for him. And maybe I would like to shorten and edit that tract by Stewart, given the standards provided by this blog, and probably also give a concise but clear discussion on eternal security and assurance. As for the discussion on Romans 7, thanks for the replies, and yes, I haven’t found any indication that Paul is talking about life being an unbeliever trying to be saved through the Law. David Stewart sounds like a Jew hater/hater of Israel in a lot that he says, unfortunately. He also goes on with the “gap theory” thing and belittles those that believe in the literal six days. So while he has the Gospel absolutely right and I am positive that God has used him in that capacity, yet beware of his other beliefs, for they are very compromised on certain issues. Sadly, I have some friends, and as they grow harder, yet more discouraged, I pray the Lord will open their eyes. They miss the irony of their hateful speech, their quick anger, their unwillingness to hear others, their false accusations, but yet I still fear for them. I praise God when some are delivered, one recently admitted that she had become suicidal because of the teachings of men like Macarthur, Chan, and Washer. Praise God, her eyes were opened. You know Bryan, when I first found Stewart’s site, and after awhile remembered the admonition to “prove all things”, I found the reason for why I should not recommend the site after doing some research and making sure I double checked the findings. Through many Calvinist discernment sites I have found truth regarding error in other areas, but I would not want to recommend them any longer either. Oddly, even on a Mormon site, they correctly identify the issues with Tyndale’s reformed thinking on the word repentance, but definitely don’t want someone mislead by Mormonism. So just will say I won’t say here what it is that David Stewart has done, and he quotes many who are decent teachers, and I will not judge his condition, but I couldn’t recommend his site either. Praise God though that He is the one that gives us what we need to know, I marvel at the protection I have had when many times I did not deserve it, but I thank Him that He allowed it, so much error, but I learned also through it. Thanks for your observation on Stewart. We do appreciate your landing up here at ExP. As has been said, we can only warn of potential error. We have all, at one time or another, gleaned some good information from web sites we may not otherwise recommend. Discernment is essential!! We try not to advertise sites which we know have doctrinal problems. We have removed, after investigation, some formerly recommended links from ExP after being advised of error by our readers. We appreciate all input. That is sad.. but we are so thankful that you understand the perils of paying attention to Calvinists. I’m glad this discussion on Romans 7 came up. A few years ago I read a conversation online between a couple of Calvinists. They decided that Paul’s struggle must be before he was regenerated. This confused me even further at the time. It made me doubt my salvation because I knew I still struggled with sin. I don’t know how anyone under Calvinism/LS can feel any assurance of salvation. Thanks Holly. And thanks to everyone who participated in the tract production! It has been an enjoyable and enlightening process. I appreciate the variety, quality and importance of the input. I think that we should stop adding more items now, though; otherwise, the “tract” will become gigantic and cumbersome. Feel free to print and use the grace tract if you wish. Also, please feel free to continue to converse on this or other subjects of interest. You are all such a blessing! On a good note Bruce, there should be plenty of false comments on my page regarding what the gospel is…. Also, maybe when this tract is finished you could send it to all of them. Glad I could add something to the discussion. I could tell right away though that some of the guys were coming from totally different viewpoints than me. I agree about MacArthur. It is a shame that passages of scripture like James 4 are passed off as an appeal for salvation. That is part of the problem. Confusing sanctification principles with justification or conversion is a recipe for a works gospel. Oh! And the obvious one that John Macarthur always preaches from James 4, and says it IS the gospel, however he leaves out verses 5 and 11, clearly showing these are believers being spoken to. Clearly it is present tense, and a believer whose mind serves the law of God, but whose flesh still has evil present. And these all speak in the present tense to believers. JR, Romans 7 has Paul talking about his own experience and the internal struggle that he was going through as a believer. I don’t see it as a person trying to struggle to become a believer. Does that make sense. Maybe others could elaborate. Heading to work now. I’ll open this question on Romans 7 to everyone for now. However, I believe Bruce’s goal is to encourage short, Biblically accurate statements of Salvation to compile into a tract form. That web site message did not meet that standard. In addition, I read through some other of the info and links on the listed web site and I conclude there are some incorrect statements which we do not wish to promote here at ExP. Regarding Romans 7, some say it is about an unsaved person trying to be righteous through the law, is that explanation also possible? What it all really comes down to is that people that peddle this false “gospel” of commitment/bilateral contract/”We believe it’s a change of mind too only pay no attention to the fact that we can’t even get THAT right because we still manage to really mean ‘turn from one’s sins as a condition for salvation'” so-called “requirements” for salvation nonsense DON’T BELIEVE THE GOSPEL. Holly, I find it quite apropos that right after reading your initial comment I found myself thinking, “What I’ve been dealing with at a Calvary Chapel is basically the same exact thing these bullies on your Facebook account believe–only in my case they’re much more polite and well mannered. Let’s face it–they’re LOVING. But they’re also WRONG. Then I read Jack’s comment where he indicates the Blue Letter “is compiled and sponsored by the associations of Calvary Chapels.” Hmm. Why does that not surprise me? Which is of course why this Sunday, I’m saying good-bye to my Calvary Chapel once and for all. Pray that I’m able to sow seeds of truth and grace on my way out the door. Holly, the rubbish that you posted above is so typical of people who distort the Gospel. They know that the Bible teaches that salvation is by Grace alone through faith alone in Christ alone. The problem is, they don’t believe it! “We are sinners. To get to heaven we have to be perfect. We’re not. God says the sin must be paid for. You might say “well what is the answer?” Religion comes along and says “be good, go to church every week, give money, be sincere”, you know “put Christ on the throne of your life.” All these kinds of terms. And apply them to your life. “Commit your life to Christ, reform your life, forsake your sin, repent of your sin, you name it. “Keep the commands, the ordinances, the sacraments” whatever it may be. There is no price that we can add to obtain salvation. Christ paid the price. There is no additional price to be paid on our part. We must simply put out faith in Christ alone to save us. Incidentally, the Blue Letter Bible is compiled and sponsored by the associations of Calvary Chapels. They are prone to error in several doctrines. (recommending FF Bruce is a prime example). You might also note the recent addition at least on blueletter, I don’t know when they added this portion from the Puritan reformer, F.F. Bruce, initially, they had 1 & 2, but now there is a little section added which I’ll italicize. I just had to share this with you Bruce….on my FB page, several are now piling in to argue about my two posts on Macarthur, even calling in friends, tagging them, one guy tagged ten. But one that came in quoted A.W. Pink, then Macarthur, Spurgeon, Washer, then Tozer, several quotes were on this page (blank this out if you want, “truthsource . net”), and so out of curiosity, I went to their gospel presentation. Fall down before Him and stop trying to justify yourself and think you’re good enough. Admit your wickedness before a holy God, your helplessness to do anything to please Him, and trust in nothing except what Christ has done. If you come to Christ, repenting of your sins and believing in Him, you will be saved. It doesn’t matter what you’ve done, and you don’t have to clean up your life first, just come to Him now and He will change you. All your sins will be washed away. And not only will He take away all your sins, He will also give you His own righteousness through the work and merit of Jesus Christ His Son! Come to Him, all you who are weary and heavy laden, and He will give you rest for your souls. there is this idea that a saved person is supposed to hate sin, but if they somehow “stumble” they then have to confess and ask for forgiveness in order to remain saved. Would that be considered some form of works? I’m thinking it does but wanted a take from the posters here. I put those comments in. Re. the question on the strange theology that you mentioned, I agree with Jim and David. I had never heard of it either. It seems as if nowadays so many people want to bring forth some type of new inventive theology, rather than just sticking with the clear teaching of the Bible. I recently wrote a review of a book about such a “new” theology. It’s at the publisher now, so I can’t say anything about it. I’ll let you know when it comes out. If it is not accepted, I can still run it here at ExP. Welcome to ExPreacherMan.com. Thanks for visiting and writing. Bruce has answered you very well about Calvinism and the Acts churches. Let me steer you away from most seminaries. They have (in most cases) been called Cemeteries for good reason.. a place where excited young Christians go to have their zeal for Christ die. I would highly recommend a Bible College to you where you will receive valuable Bible lessons on God’s Grace without mixing in the false teachings so prevalent in most seminaries. Here was one on FB. When asked what one did with the woman at the well or later they asked about why Paul still sinned, this was the answer. Dear soul, those whom were forgiven were changed and left their sin…Jesus didn’t forgive those who stayed in their sins…He didnt say to the pharisees who refused to repent “Your sins are forgiven” Dont be fooled if you stay in sin and won’t turn from the broad path, then you won’t find the forgiveness needed to enter heaven..Rather hell instead…Time for you to repent and seek to know Jesus and he will lead you and forgive you……. The tract I use now is like the ones we used in our church, while not as complete as I would like, it is printed by Quentin Road Bible Baptist Church just outside of Chicago. Jim Scudder, founder, is a long time friend and fellow grad of Florida Bible College. A solid Grace Bible Teacher. Be sure to ask for the old blue cover version, FBC type Heaven Tract. I don’t recall their policy, whether they charge or receive a donation. Thanks for commenting today. We have many articles that speak to your comments; search them out if you like. In a nutshell, NO, Calvinism, and in particular the “New” or “Neo” Calvinism that we see in abundance today, is NOT, as you say, “better” at getting people to do good works. It basically forces or guilts people to work hard because they are motivated by fear—fear and dread that they might not DO enough to merit eternal life one day. Guilt and fear are lousy motivators. Free Grace theology, on the other hand, encourages the genuine believer in Christ (we are saved by grace alone through faith alone in Christ alone—Ephesians 2:8-9) to desire to serve God out of love and gratitude for all that he has done for the believer. You ask, “what’s wrong with these ‘Acts church’ movements going on?” I would answer that they are not “Acts church movements” because they are preaching another gospel, a false gospel that adds works into the mix to acquire, to prove and to try to hold onto salvation. The warnings of Galatians 1:8 apply. Thank you for those, Jon! We just put them into the tract. i’ve been following this blog for a while. i’m only in college, but is it foolish to enter seminary for the sole reason of preaching the gospel and fighting against calvinism? i hate calvinism with a passion. on the other hand, i’ve noticed that calvinism theology really is “better” at getting people to do good works because they’re kinda forced in the theology. many calvinist (or maybe even noncalvinist) churches are emphasizing so much on discipleship? why do you think that is? is that alarming? given that these churches preach the gospel (assume the correct one), they push for disciple-making. biblical discipleship IS going all out and counting the cost, no? so what’s wrong with these “Acts church” movements going on? I, too, have noticed that so many church or organizational statements of faith, regarding salvation, start out fine, declaring the gospel of grace, yet quickly negate their opening remarks with the addition of required works. So sad. I keep my Heaven Tracts in my nerdy pocket protector and no sweat, so to speak. At the rate we are getting such great suggestions from so many dear readers, Bruce may have to make it a Gospel Book rather than a tract. Lots of wonderful ideas here. We’ll put those into the tract. My comment: I would extend that to “asking Jesus to save you.” One does not have to ask, just believe. You are right — it doesn’t work — for anybody. It is false. Read Terry’s comment about her witnessing to her son. Wonderful!! Good comments; we’ll plug them into the tract. I never could get the one about salvation being free yet costing one everything—contradictory LS language there! We added those quotations in today. The verses from John 3 really say it all! Excellent additions to our collaborative Gospel tract! More false definitions of even what faith is, by W.E. Vine as quoted by Macarthur in “the Gospel according to Jesus”. Spurgeon’s turn or burn sermon can sure give you a lot of things “not” to say…. Have a man now on FB, who objected to my outing John Macarthur on his many conditions to “enter” into the narrow gate who just added some Spurgeon now. He said I was slandering him. Jim F., even more perplexing than the “head scratcher” from Spurgeon is the people who insist he wasn’t a false teacher. (false statements )-faith alone justifies but the faith that justifies is never alone. (this is a common tract prayer) believe in Jesus, feel sorry for your sins and turn or be willing to turn from your sins etc,etc. Thanks for dropping in and for your comment. You are right.. the mention of “repentance” can often cause confusion.. but if it comes up while witnessing then explain it (and I know you can). Tell your lovely wife “Hello” from Shirley and me. Jim, I understand what you are saying regarding the Spurgeon quote. Andy, I have prayed for your family to be comforted in the passing of your mother. Also, I have praised God for Noah, my young brother in Christ. Salvation is like a row boat. One oar is faith. The other oar is works. If one uses one oar only, the boat goes in circles. If both oars are used, the boat travels in a straight path to its destination (i.e., heaven). But we are not going to Heaven in a rowboat. Rather, we are carried to heaven on the shoulders of the good Shepherd, Jesus Christ! Based on Dr. Harry Ironside sermon. Salvable meant “capable of or suitable for being saved or salvaged.” Many Calvinists make God have to do everything – even including making us believe / repent. I actually heard Reformed guys say that at the cross is when God actually saved the elect. They then try to reason that either all men were saved or only the elect were saved. Many don’t think of it as Christ making it possible for any lost man to believe. Thanks for sharing with us today. Your gospel statements were placed into the two categories. Please accept our heartfelt sympathies on the loss of your mom. I am praying for your family. I lost my mother very recently too (she knew the Lord). What a joy it is to hear of Noah’s trusting in Christ Jesus alone for salvation. What a wonderful blessing! Thank you for sharing that blessing with us. Oh Andy, God bless you and your family, so sorry to hear, so happy for her promotion and being able to think clearly, how wonderful. What more rejoicing there was for Noah. I explained to my son Koby when He received the Lord, that that terminology of “asking or accepting Jesus into your heart”, likely comes from a couple of passages, that explain what happens when you believe. One is John 1:12, But as many as received Him, to them He gave the right to become children of God, to those who believe in His name. I think that’s where people get the ‘accept’ Him, and for asking or praying a prayer, I believe likely that came from the several passages that talk about calling upon Him to be saved. And the obvious, talking to Him or anyone you are starting a new relationship with. As for the asking Him into your heart, I just explained to Him that Jesus coming to live in His heart is simply something that takes place when he believes in Him. God bless your family with one absent from the body and present with the Lord, and another a new believer, what a blessing and I pray you all will be comforted. These first Bible verse pictures I made are mixed in with some others, like a few birthday pictures, but if you would like to use any for comfort or family, you are welcome to download and print. I am making some more for a friend who lost her dad yesterday. I have to say a big time “ditto” re John’s problem w/ Jim’s 2nd Spurgeon quote. I read it 3 or 4 times and if anything got MORE confused every time I read it. Baffling. Prince of Preachers my eye . . . Okay. Rant over. Tonight I received word that my Mom passed away, and she is now in the arms of her Savior! We rejoice knowing that her mind is no longer tormented by the raveges of Alzheimers and also that we will see her again one day in glory. Our greiving turned into joy tonight because this event provided an opportunity to talk to my 7 year old son, Noah, about death and salvation. Noah asked me to help him get saved. I told him that I couldn’t “help” him, but I could show him the way of salvation (Jesus said I am the way, the Truth, and the life!). By the time we were finished, Noah declared that he believed on the Lord Jesus Christ for his salvation! Paise God!!! During my conversation with Noah, one thing he asked me was, “why do people say to pray and ask Jesus into your heart?” I told him that he asked a very grown-up question, and that is something that confuses grown-ups as well as children. We don’t “do” anything to be saved. It is a free gift. We only need to BELIEVE! So I would like to add that the notion of “praying a sinner’s prayer” or “asking Jesus into your heart” is one example of a false or faulty gospel. We plugged those expressions in. Andy, I agree with you that it is often unnecessary to bring up repentance in presenting the Gospel. The exception would be if the listener has questions about it – usually stemming from having heard unbiblical definitions of repentance. Jim, I don’t even know what the second false gospel quote from Spurgeon means. One stuck with me with Paul Washer. This man came to a sermon and told him after he was dying, was given three weeks to live. Paul decided not to leave until this man got saved…. This is basically what Washer told him, to go to his room and call out to God “until” He saved him. The man read John 3:16 and said he KNEW he was saved, and Paul Washer in typical style asked him HOW he KNEW that…. The man asked him, “haven’t you ever read John 3:16”? A new believer, understood the gospel more than this “preacher”…. I see the usual expressions are already posted. Will post again if I think of more. Amazing (isn’t it?) how people add qualifications and works to the simple, clear straightforward Gospel message of the Bible (Ephesians 2:8-9). Yet people buy into this nonsense wholesale! Thanks for all that you do in getting the Free Grace Gospel of Christ out to the public. Bruce, it was just so timely, considering the subject today. Here are just a few things he basically was saying in his ‘sermon’ on the ‘only way to heaven’. The other things I’ve seen THEM say. We plugged those into our tract. Yes, you appear to be on the right track with Holly’s listing of MacArthur’s works-based approach to salvation. I’ll make a brief notation on the “tract” list so people can link to the full list to see the details. The really diabolical nature of MacArthur’s teaching is that it is so “over the top”, that it makes less obvious forms of works for salvation more difficult to spot. So, Satan is using him as a decoy to make other forms of works for salvation seem reasonable by comparison. It’s kind of like when they put a $1,200 sweater front and center in a women’s clothing section of a department store. It is there to make the ones that are overpriced at $300 look to be reasonably priced by comparison. Sorry for breaking your posting rules on this thread Bruce! John, that was but a snippet of the sermon that had me so appalled. On one hand, Paul Washer was defining the “narrow way” as works, and “discipleship”, a two-part gospel if you will. So I thought to myself, if Washer preaches it, so does Macarthur, just a little more craftily, I bet if I google the “narrow gate” and Macarthur’s name, I will find it. Amazing how he defines the Narrow Gate? Makes it clear John Macarthur denies Jesus is that Narrow Gate doesn’t it? Oh sure, he says Jesus is the gate first, but by his works (his words following) he truly denies him and re-defines the Narrow Gate, and then cleverly adds to the truth with his wisdom of words. He corrupts the minds from the simplicity that is in Christ. Holly, thanks for this appalling example of how two popular teachers (MacArthur and Spurgeon) perverted the Gospel! That’s their version of they “good news”? That’s their version of a “the gift of God”? The only “soil” that MacArthur knows anything about is trying to soil the Gospel! I’m a bit confused . . . is all the copied/pasted stuff above from John MacArthur supposed to be prime examples of inappropriate verbiage for a gospel tract? I realize that may be a silly question, but I like to be sure. Sorry if my confusion insults anyone’s intentions . . .
utmost exertion because Satan is mighty and has a vast array of helpers, because he has many false prophets and deceivers all over the world, because he actually receives support from the fifth column established in every man’s heart, the love of sin. take possession of the Kingdom with all its blessings of salvation. This is not for weaklings. This is not for waverers. This is not for compromisers. This is not for Baalams. This is not for the rich young ruler. This is not for Pilate. >>>This is not for Demas. This is not won by deferred prayers, by unfulfilled promises, broken resolutions and hesitant commitments. It’s for the strong and the sturdy, like Joseph and Nathan and Elijah and Daniel and Mordecai and Peter and Stephen and Paul and Ruth and Deborah and Esther and Lydia. The conflict is often fierce. And submit fully to Christ? There’s a battle there, but you must enter, you must enter this narrow gate, you must enter alone. You must enter with difficulty. And fifthly, you must enter naked. You can’t go through a turnstile with your baggage. It’s the gate of self-denial. It’s the gate of self-denial. Strip off all the sin and self and self-righteousness. It’s the way you unload yourself. Dropping all the baggage isn’t easy. The rich young ruler wouldn’t do it. He was very rich. He wasn’t about to let go of his money. He was very much in control, he wasn’t about to do what Jesus told him to do. He wasn’t going to let somebody else be sovereign over his life, hung on to his baggage. When Jesus told the story about the soils in Matthew 13, the different soils, in some of the soils the weeds were never cultivated out. Some of the soil, the stony ground, was still remaining hard. Superficial response initially, but no real life, no real fruit. If you’re holding on to anything that you’re not willing to let go of, you can’t get through this. It’s where you abandon yourself totally. It was Spurgeon who said this, “You and your sins must separate, or you and your God cannot come together. Sorry to make this so long Bruce and Jack, and feel free just to copy for yourself, but look at all the conditions in just these short paragraphs and look how he defines THE GATE…. Thanks… I agree with John – great idea. When I hand it to a person, I ask them if they have ever thought of that question before now. Yes or no, either way they answer opens the door for continued conversation and presentation of the Gospel of God’s Grace. Will come up with some comments later. “Faith sandwich” – works on the outside, faith in Christ on the inside. Can also be served “open face”.